Objectives: To understand the risk management planning and identification processes and to employ various tools and techniques for risk identification. ESI provides us with a practical 9 step risk management risk management process and this will provide a foundation for risk identification. Risk management is an ongoing process and is revisited throughout the project. Examination of the Project Plan is the first step in risk management. The plan provides essential information regarding sources of risk. 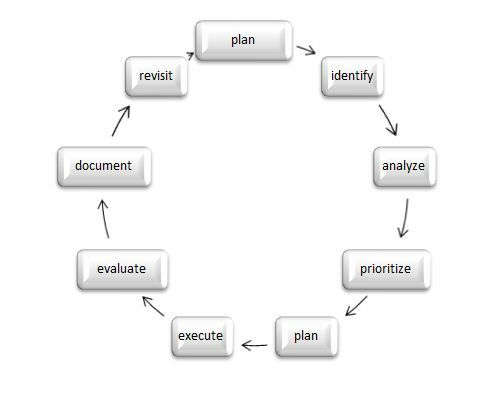 Identify risks in the plan as separate from ‘Tasks’ or elements of the WBS in the project plan in a risk document. Analyze risks in terms of impact and probability. Create a Plan to address the risks. Execute the Risk Management Plan in step 5 above. Evaluate the results of step 6. Document these results for future use. Revisit the risk management plan and the project plan. Previous SUCCESSFULLY MANAGING RISK IS EASIER THAN YOU THINK!